Alisson has described his emotions after Liverpool beat Cardiff 4-1 at the weekend. The Brazilian was looking to rack up yet another clean-sheet, his 7th in total since joining the club, but conceded a bizarre goal to Callum Paterson, whose second-half effort was Cardiff’s first touch in our box! In the end it mattered little, as goals from Xherdan Shaqiri and Sadio Mane eased us home, but we’ve seen plenty of occasions before at Anfield when a 2-1 lead becomes a 2-2 draw following a nervy final 15. 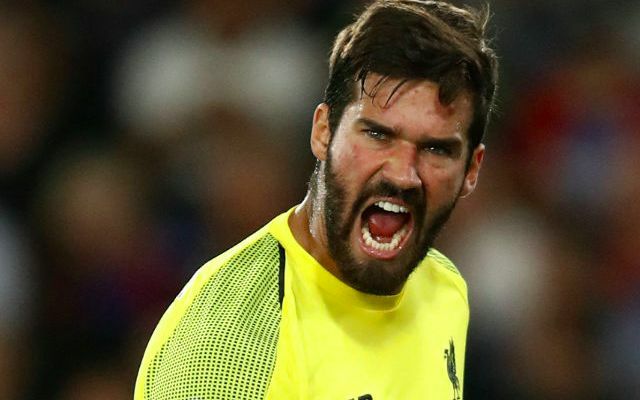 “I came off the pitch very angry, definitely, for having conceded,” Alisson told the official website. “The objective for the entire team is a clean sheet so it’s frustrating to have conceded. But the most important thing is the result; the victory is more important for me. “It is mixed emotions – you’re angry at having conceded but that soon blows over and the victory is the most beneficial thing to us. “We were really unlucky with the goal we conceded, it was a deflection and there was nothing really the defence could have done. It’s fantastic that Alisson has such an attitude and has set such high standards for himself. We believe he’s as good as any stopper in the country and it’s this kind of devotion which will enable him to prove it. Alisson may have done slightly better for Cardiff’s goal in that he didn’t seem prepared for Paterson’s shot, but this is a small criticism. In reality, he has helped transform our backline into one of Europe’s very best. He’ll likely have more to do on Saturday at the Emirates, as Liverpool take on in-form Arsenal and the likes of Pierre-Emerick Aubameyang and Alexandre Lacazette up top.